For most Canadians, washing your car is a weekly routine. Why wouldn’t it be? Dirt, mud and dust are always collecting on the exterior of your vehicle and need to be cleaned. The need to clean a vehicle is often obvious, but the need to clean off the outside of your property is not. An exterior cleaning of your home or business can give new life to your space and it is as easy as picking up the phone and calling a Gorilla. Our Barrie pressure washing service can have your space looking like new in no time at all. In order to get the best possible results for our clients, Gorilla technicians begin every Barrie pressure washing service with a proper assessment of your space and the marks or discolourations on it. By figuring out just what we are dealing with, our Gorillas are able to treat your property in the best way possible. Pressure washing sounds simple enough, right? The point and shoot method seems pretty straight forward but there is much more to it than that. The first step to a proper Barrie pressure washing service is treating the affected area with an eco-friendly cleaning solution. These cleaners pull up surface dirt so that it can be pushed away with our Gorilla Brushes. Once we have a clear view of what is left behind, our Gorillas get to work pressure washing those stains away. They might seem like high-powered spray guns but pressure washers can pack a punch. In the right setting, these tools can do wonders for your home or business but they can also damage construction materials and even break skin. 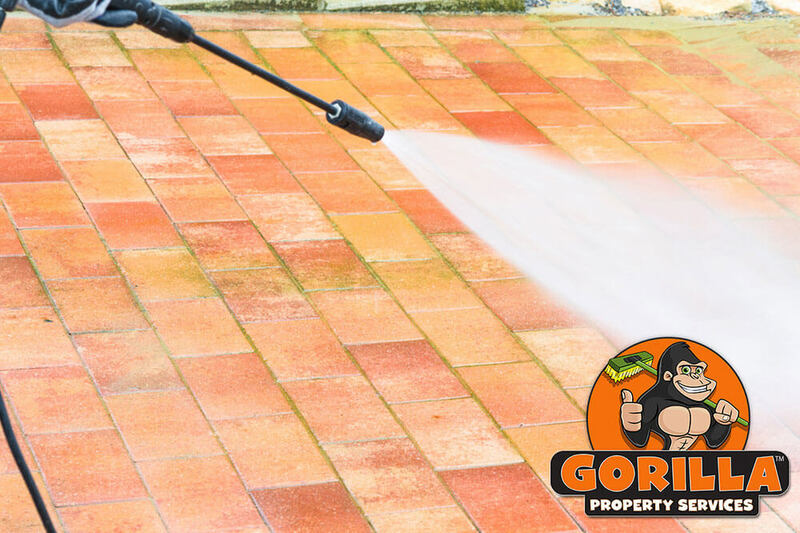 As Gorillas arrive to perform your Barrie pressure washing service, you will seem them taking all the necessary precautions to protect themselves as well as your property. By sectioning off the treated area from any exposed reservoir entry points, you can trust that there will be no cross contamination around your property.